Last week Dylan’s solid deodorant broke into about a hundred pieces in her dance bag. Has that every happened to you?? Ahhh….it’s so frustrating and annoying. I’ve even tried in a desperate moment smoosh the pieces back together to just swipe enough to get me through the day! Ughhhh…not pleasant at all! One of Dylan’s dance teachers let me know of an awesome roll-on antiperspirant/deodorant that she discovered after having one too many solids crumble. I know….roll-on is old school….but I’m telling you it’s a new and improved version! 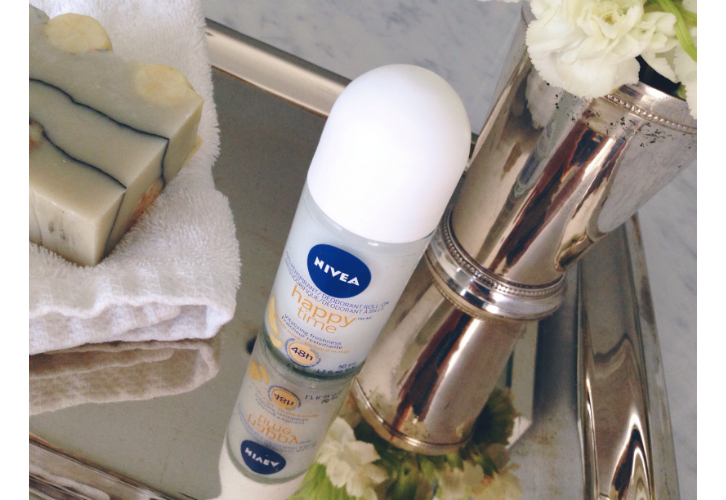 Dylan and I have both been using Nivea’s Happy Time Anti-Perspirant Roll-On and we are converts!! Yesterday it got me through a 12 hour dance day prepping the girls for 9 dances with some quick changes…and it passed the test! I love the crisp, fresh and light orange scent. Dylan says it’s very refreshing and she’s uber particular about her deodorant! A few more bonus points for the roll-on…I love the glass container, it really does work all day, it doesn’t leave pesky white marks on your clothes….and it’s super reasonable at $2.49. So, who’s going old school with me?